Helsingin historialliset tilastot on kokoelma Helsingin kaupungin historiaa kuvaavia tilastotietoja väestöstä, asuntokunnista, asumisesta, työelämästä ja koulutuksesta. Tilastojen aikasarjat vaihtelevat alkaen vuodesta 1811 jatkuen osin 2000-luvulle saakka. Tilastot perustuvat Helsingin tilastollisten vuosikirjojen ja Helsinki tilastoina 1800-luvulta nykypäivään -julkaisun tietoihin. This dataset provides data on migration in Helsinki by province 1911-1994. Please refer to the Finnish metadata for a complete description of this dataset. This dataset provides the population of Helsinki by age and gender 1900-1961. Please refer to the Finnish metadata for a complete description of this dataset. This dataset provides the Helsinki census by district 1.1.1875-1960. Please refer to the Finnish metadata for a complete description of this dataset. 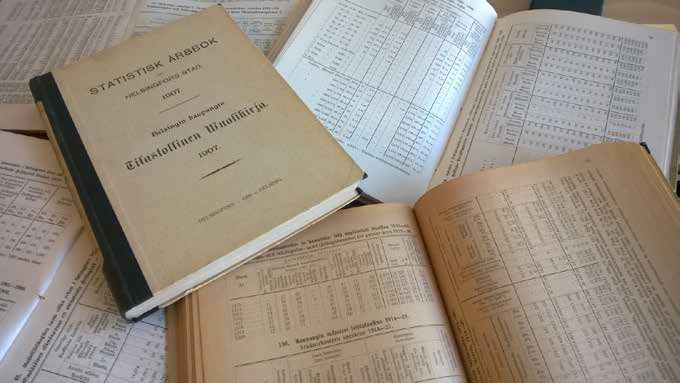 This dataset provides statistics on migration in Helsinki by gender 1881-1998. Please refer to the Finnish metadata for a complete description of this dataset. This dataset provides data on completed dwelling units in Helsinki 1921-1967. Please refer to the Finnish metadata for a complete description of this dataset.